Xicanx performance artist and multi-instrumentalist Lu Coy (they/them) presents a queering of sound, space, and the maternal body; guiding their audience through a collection of ritualized sonic pieces that explore the artist’s maternal relationships to memory, migration, cultivation, disease and parasitism. Ambient soundscapes undulate between delicate haunters and fearsome, unyielding roars, forming the pulse of this florid work. Fueled by an obsessive desire to document fading spirits, Coy roams freely through the temporary architectures of memory- to speak with the dead, salvage their forms, and reenact moments of personal loss and failure. Lu Coy is a mixed media artist and musician based in Los Angeles, California. 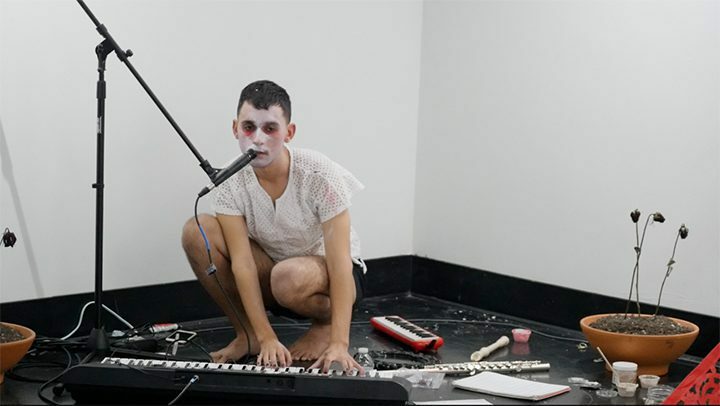 Originally from Southwest Texas, Lu is of Xicanx /Tejanx and Ukrainian Jewish descent, and creates work in the form of ritual performance art, video, object, experimental music and song. Much of their practice stems from an interest in forging a tangible identity as a multi-ethnic, queer person of color and a desire to give closure to moments of unresolved personal or ancestral trauma- creating reenactments or performances of identity through investigations of mourning, shame, failure, consumption, childhood/adolescence, beauty and gender. As a multi-instrumentalist and vocalist, Lu performs frequently with several prominent groups in LA’s underground queer-latinx music scene (SanCha, Sister Mantos, Sin Color) and has appeared on tracks for artists such as Eyvind Kang, Avey Tare, Blonde Redhead, Tyler Holmes and PJ Sin Suela.